Giving is an important part of cultivating well-rounded finances. Donating to charity can be a good use of your money, and it can help you feel good about what you’re doing to make the world a better place. Unfortunately, just giving your money isn’t always enough. There are few things in this world more disappointing than being generous to a cause that you think is worthy, only to find out that the charity isn’t using its money wisely. The reality is that there are costs associated with running any organization â€“ and this includes non-profit organizations. Even charities need to pay some of their administrators and executives (or there might not be capable people who can afford to help out), and there are costs associated with renting buildings and sending out fundraising materials. All of these are costs that come on top of spending money on a stated mission. Even though these costs are realities for many charities, though, it’s not an excuse to use money unwisely. There are charities that spend so much on CEO and other executive compensation that there is comparatively little left to actually help those the charity is designed to help. There are also charities that focus so much on fundraising, and that spend so much money on trying to raise funds, that causes fall to the wayside. Rather than giving to charities that spend a lot of money on things that don’t actually advance the cause or make life better for others, it makes sense to put your money to the best use by focusing on charities that spend donations wisely. You can see how much of your donation dollar is going to executive compensation, as well as how much goes to other program costs. Charity Navigator also rates charities on their accountability and transparency. One of the rules of thumb is to donate to charities that spend 75% or more of the donations they receive on the mission. When you look at a break down, you might be surprised to find that even some of the most well-known charities are somewhat inefficient when it comes to the amount of your donation that actually goes toward forwarding the mission. Some of the best charities, like the American Red Cross and Feeding America, put more than 90% of the donations they receive to work helping those in need. I also like the idea of giving locally, where you can see the results of your donation in the community. You might even be able to sit on the board of a local charity and make sure that the donations coming in are spent as they should be. I like to donate to the local food bank, since I know the money is being used wisely, and I can even see the positive results of the food bank in the community. What do you think? 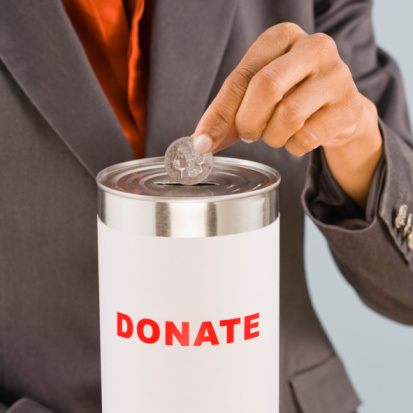 How do you find charities that spend donations wisely? Leave a comment! I personally think that donors should really get to see where their donations are going. But I admit, I haven’t heard of CharityNavigator.org before. So glad you shared it. I just love that there’s a way for donors to see how much of their donations is going to this and that. Very informative. This is a really good post. My dad is always warning me about donating because he doesn’t trust the money will be used wisely. I still like to give when I can though!